Have you ever wondered what the future of business will look like? Maybe you figured it’s going to be something like business in the past: buy stuff, sell stuff, try to make a profit by selling stuff for more than it cost you to make it, building a better mousetrap, winning friends and influencing people, crossing the chasm, riding the long tail to the tipping point with the other outliers, going from good to great, and dealing with cheese that keeps moving around. The future of business won't be like that. 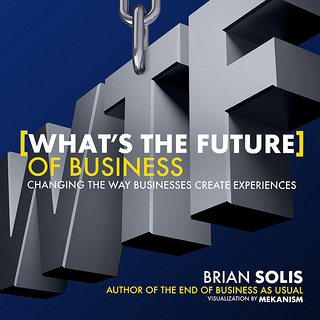 The future of business is all about dazzling people with amazing customer experiences, says Brian Solis, whose new book, What’s the Future of Business? Changing the Way Businesses Create Experiences, has a cover with the letters “WTF” in huge block letters -- a hint, perhaps, that this is not going to be some ordinary business book, but rather a radical manifesto about change, innovation, and disruption. It's business with a dash of irreverence and punk rock thrown in, a little sneer that says, Look, people, the world has changed, there's this thing called social media, have you heard of it? In this new world, the marketing of products becomes as important as the products themselves. Marketers are the ones who create experiences. Which means suddenly marketers stand at center stage, instead of off in the wings. Suddenly all eyes are on you. Are you ready for your close-up? Read this book and you will be. The Influencers' Influencer Who is this Brian Solis? Folks at HubSpot know him as a pal who will be speaking at our INBOUND conference this August alongside Arianna Huffington, Seth Godin, and Nate Silver. But according to the book jacket, Solis is “globally recognized as one of the most prominent thought leaders in new media,” as well as a “digital analyst, sociologist, and futurist.” He's an influencer's influencer, whose blog, BrianSolis.com, is considered a must-read for marketers. Solis is a rare web intellectual, a guy who can melt your brain on Twitter but can also think and write convincingly in chunks of more than 140 characters. At INBOUND, Brian will talk about how the pace of innovation has sped up and impacted the pace of change within business overall, and probably expand upon the ideas presented in his book. His Bold Ideas But what is the book about? It has one big takeaway. Companies are on a journey of transformation. We’re living in an age of digital Darwinism where you must innovate or die, all because consumers are more empowered than ever with the internet at their disposal. And in this new age, Solis argues that we shouldn't segment these consumers by age -- Generation X, Generation Y, Generation Z, Boomers, and Matures. Instead, we should use “Generation C,” in which the C stands for Connected. Generation C serves as umbrella to describe consumers who are active on the internet and social media, regardless of age. “Gen C is not an age group -- it is a way of life,” he proclaims. Too many companies are using social media but still not really talking to customers -- and that’s partly why they fail to deliver a complete experience, Solis asserts. Presumably these companies deserve points for trying, and it's nice that they've hired someone to run their Twitter feed, but they’re not making the most of the medium. To paraphrase the late great Steve Jobs: You’re doing it wrong. Solis shows you how to do it right. What’s the Future of Business: Changing the Way Businesses Create Experiences is an ambitious and ultimately optimistic look at the challenges companies face as they adapt to a digital world, a world where empowered and ever more demanding consumers bring to each transaction a new set of expectations. It’s not just a how-to book, though plenty of advice is offered. Rather it is a call to arms, a call to action, a wake-up call to brands in every industry, a book that will help anyone in marketing do a better job of surfing the storm of change that surrounds us. A must read. Also, don’t forget to come see Brian Solis speak at the INBOUND conference Aug. 19–22 in good old Boston.